These microhematocrit tubes feature capillary action to draw samples quickly. Tubes are available with heparin for finger-stick samples or untreated for anticoagulated venous samples. 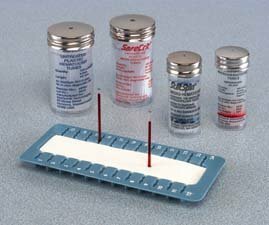 The 40mm plastic tubes are made for use with the MP multipurpose centrifuge (see 00- series) and the CritSpin* microhematocrit centrifuge (see 00-0 series). The 5mm tubes are made for use in conventional centrifuges that support the full length of the tube. SafeCrit* hematocrit tubes are made of nonbreakable 00% plastic to eliminate the potential safety hazards of broken glass.